Got the strut bar for my Turbo X done friday. Nice gains. Feels like I added a pound or two to the tires. The stock engine cover still fits. This entry was posted on Monday, November 7th, 2011 at 10.03 am and is filed under Turbo X. You can follow any responses to this entry through the RSS 2.0 feed. You can leave a response, or trackback from your own site. Does the STB work with the stock coolant tank or only yours? Nick! when will these Turbo X strut bars be available on Genuine Saab to buy? I’d definitely buy one. I bought your Turbo X downpipe and midpipe, so you know I’m serious. Please let the American Saab public know! 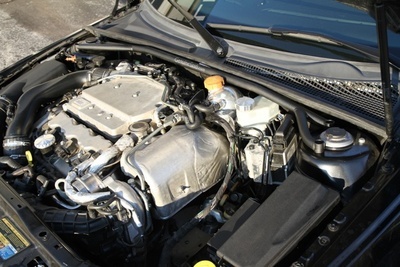 Are you going to be marketing the coolant tank, and strut tower bar anytime soon? I’ve been wanting a strut bar that’s actually made for the v6 for a while now.